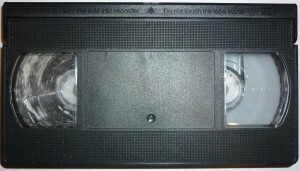 Video cassettes are prone to developing mold if not stored correctly. Moisture is video tape’s number 1 enemy. If you have cassettes that look something like this, it’s time to act quick and get them transferred to DVD or digital files. Here’s a brief insight into our tape cleaning process. VHS Tape is a lot more forgiving than 8mm video or Mini DV. The relative tape thickness is the difference. Once mold has developed on the edges of the tape it soon makes it’s way between the layers of tape which results in the layers sticking together. The edges of the tape also stick together and cause the tape to shred into pieces. So whats the fix for this problem. VHS cassette cleaners where available in the day, however, their success rate was less than desirable as the mold was removed from the tape but for the most part remained in the casing. 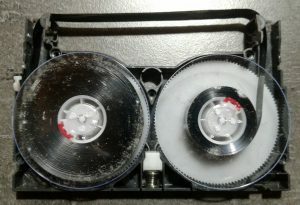 A more intense cleaning method is required to remove dirt and mold from the tape and cassette casing. We use a range of cassette cleaning tools, jigs and techniques developed over 30 years of experience. Our methods involve opening the cassette and removing the take up or supply reel and manually winding the tape under tension to gently unwind each layer. Soft cleaning pads gently remove excess mold and dirt. We then clean the inside of the casing and reassemble. We do not use any solvents or chemicals in our cleaning process, we use a dry cleaning technique. In severe cases we bake the cassette under constant temperature and humidity levels, removing excess moisture. Damaged sections of the tape are removed and the tape spliced. 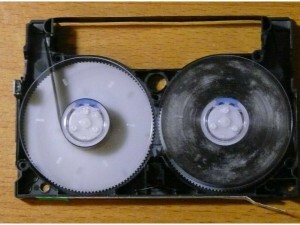 Magnetic tape can be spliced contrary to popular belief, provided you use the correct splicing films and ensure the splice has the overlap running with head rotational direction. Below is a sample of a typical before and after. Our success rate across all formats is in excess of 95%. In the worst cases some tape is lost. 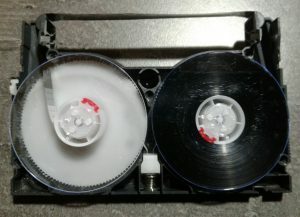 If we are transferring your tapes to DVD or digital files, cassette cleaning and repair is included. We only charge for cassette casings if required. Some tips on tape storage. Store upright, on the short or long edge of the tape. Always keep the cassette in it’s protective case. If you don’t have cases, use a paper envelope. Store with silica gel sachets to remove moisture. 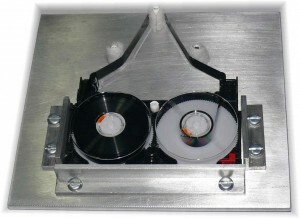 Contact DVD Conversions today to arrange your cassette transfer.